"On to Guinea Bissau, a former Portuguese and communist colony, and much different than the other countries I was in. We (I'm with two Brits now) went off the coast to some archipelagos which are virtually untouched. Native tribes, the whole bit. It was wondrous. Then I went overland inland alone to the eastern interior region, which was peaceful and beautiful." I'm sitting with Hatty on Bubaque, one of those archipelagos. It's a six hour boat ride to get here, the main island off the coast. Some days, there's a small plane, but you can never tell. Further into the islands, you'd be taking a motorboat and eventually a canoe as the only means of transportation. Look romantic? Sorry. 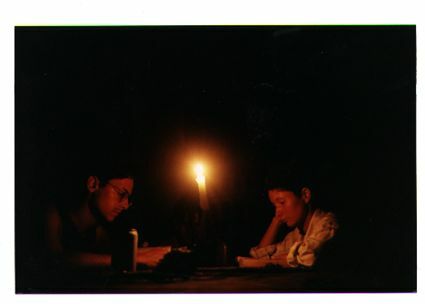 They don't have electricity at night (sometimes during the day - it's very iffy), so if you want to write home, you sit in the restaurant (it's a picnic table) and write by candlelight. And it's really hard to see by candlelight.